Move 7 blocks on the left side to the rod on the extreme right, following the rules below. You may move only one block at a time. You may slide a block onto any rod. No bigger block may be placed on top of a smaller block. A top block must be smaller than a bottom block. What is "Tower of Hanoi"? 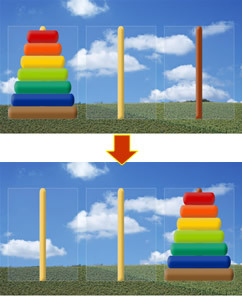 "Tower of Hanoi" was invented by the French mathematician Edouard Lucas in 1883.